The stars of NYC Media's Doggie Moms made an appearance at the Primping for Pets event at Mark Garrison Salon on February 23 in celebration of I Love NYC Pets Month 2011. Each February, in honor of Valentine's Day, the Mayor's Alliance for NYC's Animals proudly presents I Love NYC Pets Month to support its goals of increasing pet adoptions and spay/neuter rates and transforming New York City into a no-kill community. The month-long celebration features dozens of pet adoption events and other festivities to shine a spotlight on the NYC's homeless pets. Celebrate I Love NYC Pets Month with the Mayor's Alliance! Give a Symbol of Your Love for Valentine's Day! Party Hearty at the Copa for NYC's Animals! Newsletter: How Are You Celebrating I Love NYC Pets Month? Congratulations, I Love NYC Pets Month Photo Contest Winners! Just Around the Corner: Fifth Annual I Love NYC Pets Month! 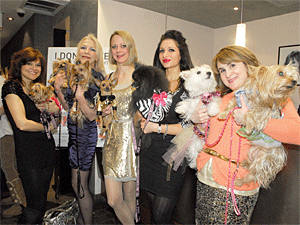 Don't Miss Primping for Pups at Mark Garrison Salon on 2/23! Get Your Tickets Now for 2/23 Primping for Pups at Mark Garrison Salon! Join the Fun on Wednesday at Primping for Pups! Get Ready for "I Love NYC Pets" Month!